Hair extensions are a very popular item among African American hair as a way to add extra length, volume or to change the color of their hair. Meanwhile, recently, a lot of white girls are interested in hair extensions, especially for some special occasion such as party, night-out or for a stunning and different wedding look. However, having the hair extensions for white girls, or white girl hair extension, is not simple like other colored girls. Hair extensions come mostly from South Asia countries, where the natural hair often has a thick and coarse texture (it can be even denser after dying). Nevertheless, white girls’ hairs is much silkier and thinner in the texture. Therefore, sometimes it gets quite confusing and awkward to have the right extension and get it correctly. In this article, we would like to help the white girls find out the best and most suitable extensions method for them. 1.1 Hair extensions are the fastest way that enables you to get the extra length for short hair. Additional human and synthetic hair are the 2 main qualities of the hair extension to achieve this goal. Human Hair As its name, human hair is the natural human hair. This source of hair come from a lot of countries, even Brazil, but the main source comes from South Asian countries, especially India, Cambodia, Vietnam, are the biggest providers of natural raw hair for extensions. Synthetic Hair It is made of synthetic fibers, has the same look as human hair but does not include any of real hair. It is recommended that synthetic hair extensions are more suitable for use in a short time because it can easily be affected by heat and friction. Its has cheap prices, and also come with various styling options. Hair extensions are the fastest way that enables you to get the extra length for short hair. Additional human and synthetic hair are the 2 main qualities of the hair extension to achieve this goal. As its name, human hair is the natural human hair. This source of hair come from a lot of countries, even Brazil, but the main source comes from South Asian countries, especially India, Cambodia, Vietnam, are the biggest providers of natural raw hair for extensions. It is made of synthetic fibers, has the same look as human hair but does not include any of real hair. It is recommended that synthetic hair extensions are more suitable for use in a short time because it can easily be affected by heat and friction. Its has cheap prices, and also come with various styling options. See more: Peruvian hair vs Brazilian hair – Which type of hair is the best for you? 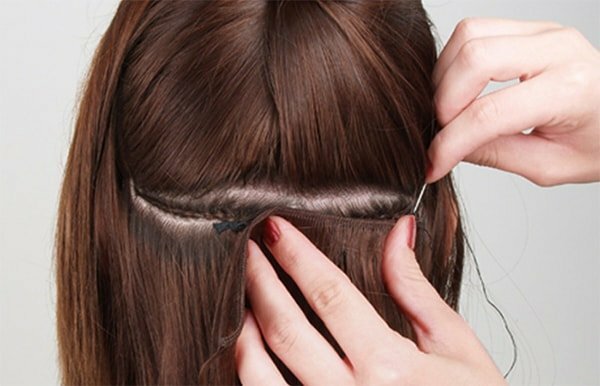 Using hair extensions, unless white girls will need to pay attention and give extra care, they may get tangles and knots. 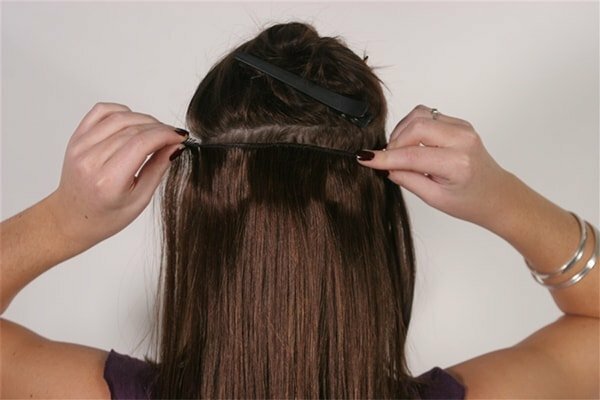 Also, when removing hair extension, you should be careful in order to avoid hair damage or even bald spots on your head. Clip-in extensions can maintain in a quite short time so that you are recommended to wash them after every 15-20 years or in the case there is a lot of product on them. Care for it just like your natural hair, gently brush, wash it with shampoo and condition and then let them dry naturally. These hair extension for white girls are pre-taped and then they are taped or glued with your own hair. 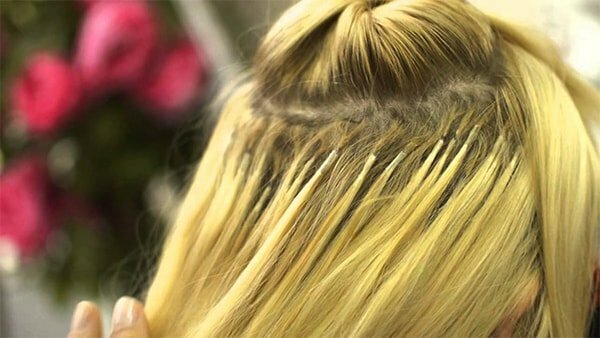 You will normally have this tape in hair extension applied by a hairdresser because this type of hair extension needs to be glued on the roots as well as applied with a heated tool which can heat up the glue. Moreover, you will need to remove them with the glue remover and then install them again. As applying the heat to your roots and scalp, combining with an adhesive product such as glue can damage your real natural hair. You need to be very careful when washing or using hair products on this type of hair extensions because if not carefully, you can make the tape lose or slip off. This is the biggest issue of tape-ins type. Because of this, you will normally be suggested by hairdressers to use some special shampoo and conditioner as well as styling products which are not too harsh and oily to make sure the glue still sticks to your hair. You can have any style you want on this hair extension because it is made of natural human hair, but still, need to be careful with the roots where the glue/tape is. With this method, the hair extensions are woven onto the braids of your natural hair, which has been braided into a cornrow first. It takes about 4 to 6 hours to complete this process. This type of hair extension will normally last between 6 to 8 weeks. There are different choices for you from a weave with an only some tracks to a full head weave to get a fuller appearance. However, this kind of hair extensions is claimed to be the most painful/uncomfortable method but it’s still popular because this is the most permanent type as well as it’s been sewn into your own natural hair so it cannot slip off easily. If you have a full sew in weave, you should moisturize the scalp as well as the natural hair at least once a week and choose to use the best deep conditioning products. Another thing that people with weaves should do is wash your hair with some special protein products to prevent the damage and effects which can make your hair weak. When you want to style your hair, you can do the same rules applied for real hair vs. synthetic hair but normally weaves come in real hair due to the period of time they are kept in. Fusion hair extensions (also called bonding or pre-ponded) are bonded to natural hair using different adhesives such as glue. It takes approximately 3-4 hours to apply for this hair extension by a hairdresser. Fusion extensions is not suitable for all clients, especially ones who have damaged hair because it is very damaging to your scalp and natural hair. The process will include a hot glue gun-like machine, which can glue and stick the hair extension to individual strands of the natural hair. With the pre-bonded type, it’s a little bit different method that you will use a heat lamp to melt the glue to tape your natural hair. Fusion extensions can last up to 6 months. This method works two ways: hot fusion method and cold fusion method. You may even have the problem of natural hair falling out if you do not care it properly and keep these type of extensions in more than 6 months. Also, this hair extension cannot be reused. Aso, it is not easy to solve this. What is more, its cost is also high. The above is a guide on white girl hair extension, which gives you a total and complete look on hair extension and their types, so that you can consider and find out the most suitable one yourself. Hopefully, you will always have healthy and stunning hair. Wishing you all the best.